I'm convinced that I have the best job in the whole wide world. I have been a Handi Quilter educator for over a decade and the job gets better every single year. I love my company, my co-workers, my retailers, and my students. Who can ask for anything more? I checked out of my hotel in Dublin, Ohio and grabbed a quick breakfast. In the restaurant parking lot, I had to Make Way for Ducklings. These were not my goslings because I left my phone on the car seat and just sat and watched the family move through the parking lot. It was a beautiful few minutes to see five baby goslings led by one parent and followed by the other. When I looked around, all of the other drivers and pedestrians were smiling broadly. What a great start to the morning! I bought a darling kit of Cluck Cluck Sew's Touchdown pattern, with Ohio State's scarlet and gray colors, of course. In case you are wondering about my allegiance to The Ohio State University, I should probably let you know that one of the people that I birthed attended that university. In other words: four years of my salary went to this hallowed institution. Ho-ly yum! Black raspberry chip is my new favorite ice cream! After safely negotiating eleventy thousand a few lane changes to continue driving north, I arrived at mom's house safely to spend the night. Is it just me, or was it a wonderful yesterday? It's true that I am often away from home, that I fly a lot, and drive even more but those are small prices to pay for the joys, small and large, that I encounter daily as a Handi Quilter Educator. 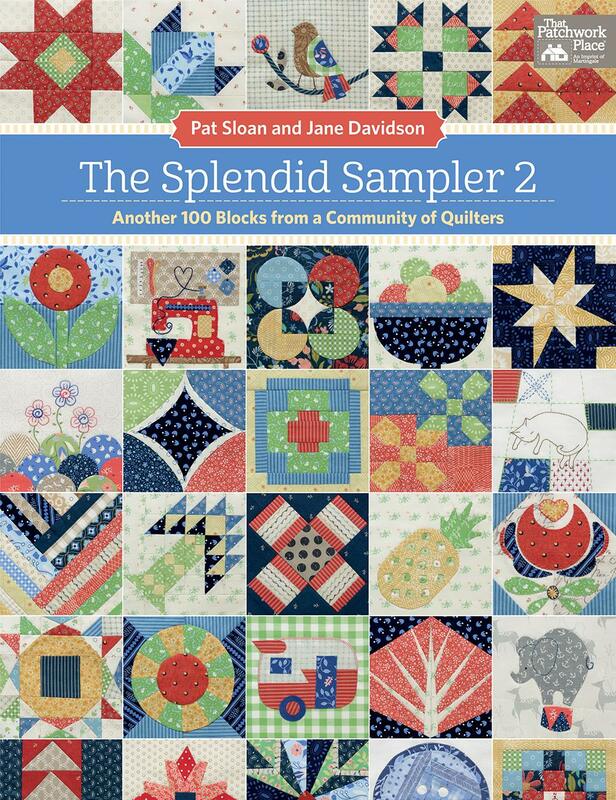 Today I am continuing my drive home and will enjoy a few quilt-filled days before I head to Bits 'N Pieces in Pelham, NH for a birthday bash weekend of Handi Quilter and other machine quilting classes, longarm and domestic. Welcome, Blog Hoppers! I'm so glad that you are visiting here today! When Shari Butler invited me to be part of her In The Meadow Blog tour, I was so excited! 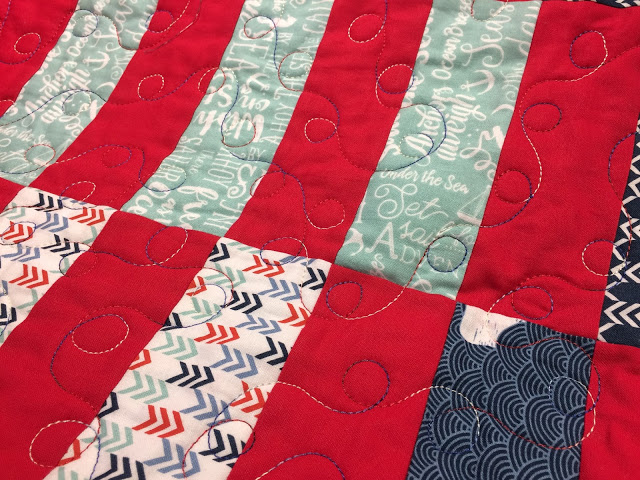 I was also a little nervous since I knew that I would be on a 6-week machine quilting teaching trip covering all aspects of the hop so I would have to pull this together from a variety of hotels and other locations other than my home studio. As soon as the fabrics arrived, I had to pet them arrange them and come up with a plan quickly. I wanted to use as many as these beauties as possible. Fortunately, I design Cutie Patterns which use sixteen fat eighths. I decided to make an In The Meadow version of my latest Cutie Pattern, A La Mode. A La Mode is a really simple pattern that shows off the fabric well. Photo day was a day full of memories for me. Hopefully this quilt will be part of its owner's memories as well. Since I am a machine quilting teacher, you may wonder how I am going to quilt this quilt. 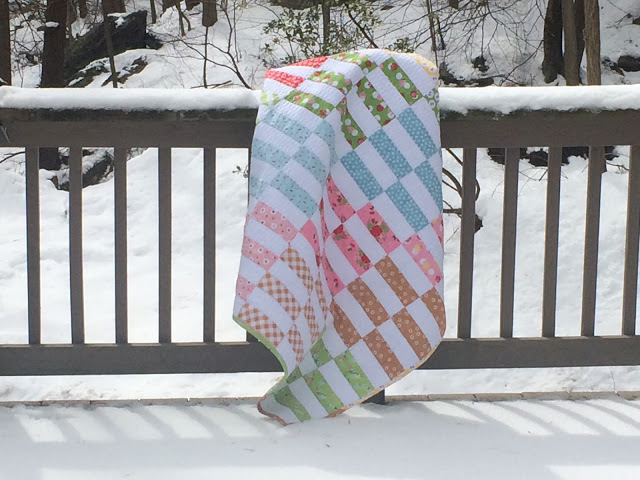 Well, I am thrilled to finally announce that I am putting the finishing touches on a video class on how to quilt this quilt on a home sewing machine. I'm always asked "What is the best way to quilt this quilt?" As you can see, each of these quilts were quilted differently and each one is wonderful in its own way! My new video class will teach all of these techniques. It's not quite ready yet, but you can join my mailing list to stay in-the-know about all of my upcoming classes. Yes, I said classes, PLURAL!!! Would you like to make an A La Mode quilt? How about an A La Mode quilt using In The Meadow fabrics? 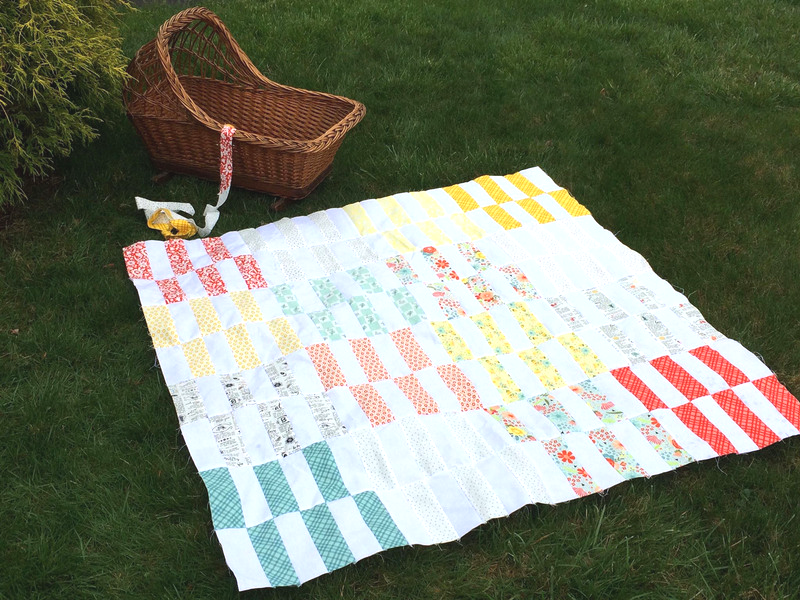 Well, enter HERE to win a kit to make this 48"x48" quilt yourself! 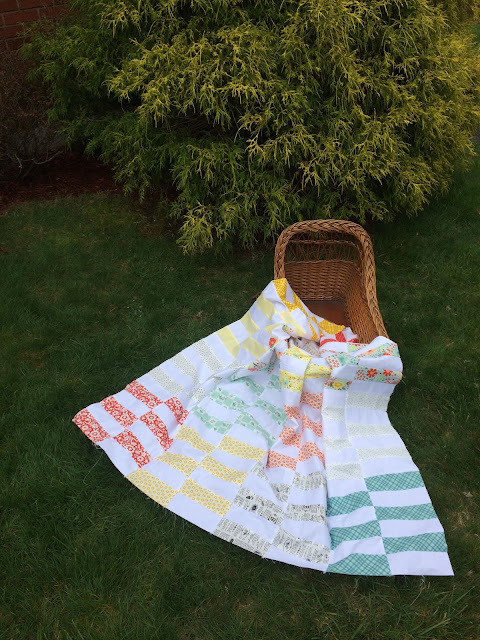 I had so much fun working on the In The Meadow blog hop. I hope that you have fun visiting all of the other stops on this tour as well! I am totally addicted to making Microwave Bowl Cozies. Have you fallen into this black hole? I've made six sets to give to family members and was surprised at how quickly they all came together. 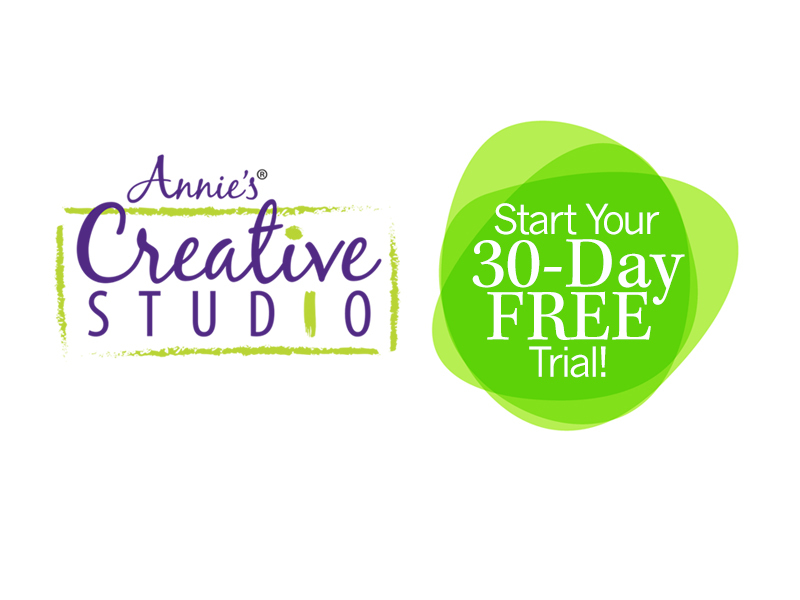 This episode is available on Annie's Creative Studio. Are you a member? 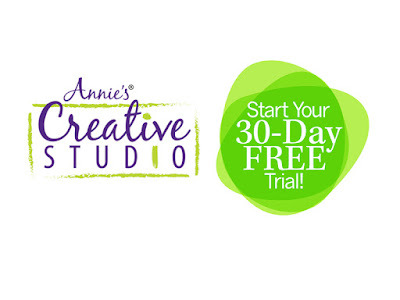 Right now you can sign up for a free 30-day trial. Click HERE for more information. This March was the longest year of my life with snowstorm after snowstorm after snowstorm and April hasn't been an improvement. The silver lining to all of the bad weather and accompanying aches and pains was many snow day/sew days at home! 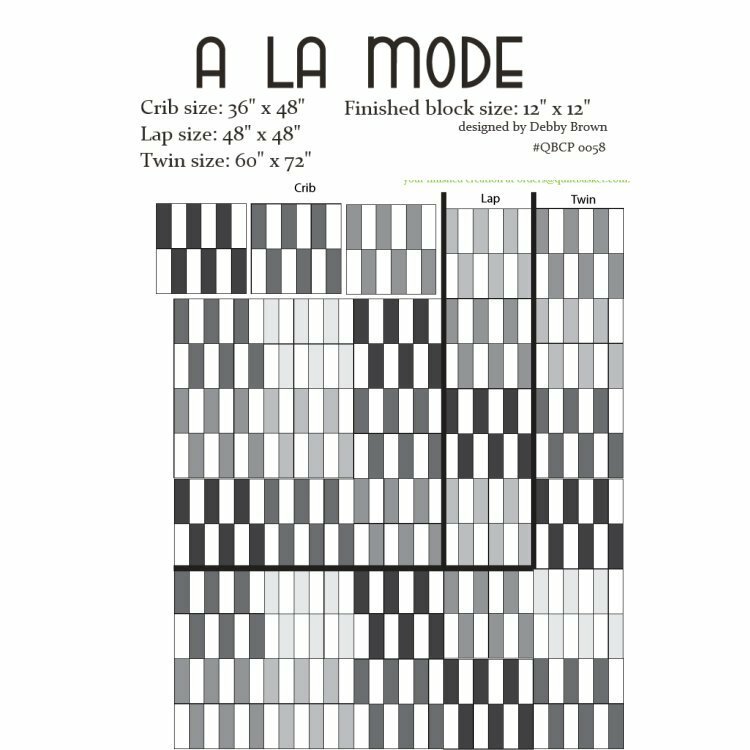 I made a graphic black and white version of my A La Mode Cutie Pattern. I'm sew in love with the walking foot on my sweet Hedwig and I'm thrilled to be teaching a walking foot class at the International Quilt Festival in Houston in November! 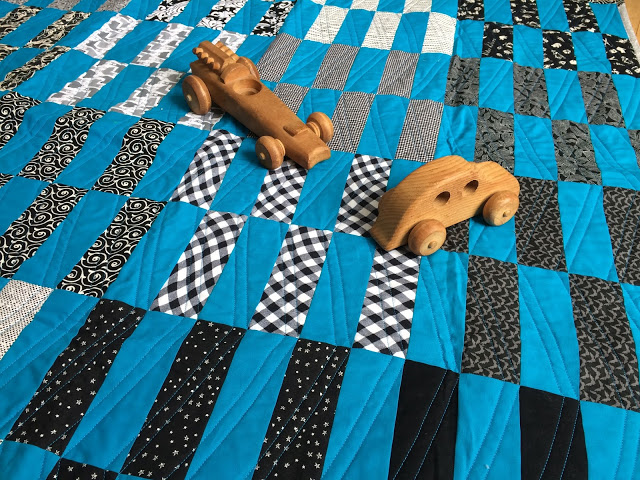 Did you notice the cool cars sitting on the quilt? I never knew any of my grandparents but my oldest uncle filled the role of Grandfather in my life. These were his handmade cars and I was honored to receive them when he passed away a few years ago. What a treat to see my own grandbabies play with them! Pick from the shelves at your local quilt shop? Browse online shops and look for inspiration? Follow specific designers online and wait (im)patiently for their new lines to hit the shelves? However you find your fabrics, all fabrics start in one place -- with a designer. When I was at Quilt Market in Houston, I interviewed several fabric designers to find out what inspired them to create their next lines. Are you a member? Right now you can sign up for a free 30-day membership. Click HERE for more information. I can't wait to go to Quilt Market in May to see what these talented designers have created for us this year! Surprise Revealed -- A Very Splendid Sequel! One of the secrets I've been keeping is that I'm one of the designers for The Splendid Sampler 2!!! I'm so excited to be a part of this project and I have a few surprises to share about it over time. *By purchasing through an affiliate link I may, at no additional cost to you, receive a small commission to keep my website running. 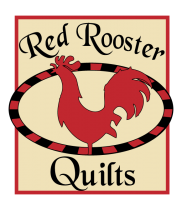 This week I am working for Red Rooster quilt shop at OSQE Cleveland. 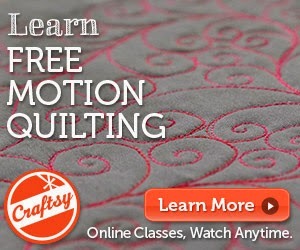 If you can, come and visit me and try out the newest Handi Quilter machine! My trip to Cleveland started out well. Even though it's 500 miles from my house to Cleveland, I choose to drive because it's much less stressful (and germy!) than flying. While driving, I design quilts, make a few chatty phone calls, and listen to audiobooks. The miles just fly by! Every time I drive through Pennsylvania, I see a huge sign reading PIEROGIES on the roof a building near the interstate. I've promised myself that I'd stop and check it out someday, and this trip was the time! I'm trying to save the pierogies until I get home, but my hotel room has a kitchen and a fry pan. The struggle is real! The drive became a bit stressful as the snow and winds picked up. I am friends with some truck drivers so I'm always a polite driver around the big rigs. That day I gave them even more space because the winds were brutal and they were trying so hard to stay on the road. The drive became challenging when it came time to... um... find some facilities. I pulled off an exit and the power was out due to the high winds, closing all of the restaurants in the area. I had to drive a while to find an open restroom restaurant but found one just in time! Can you see Shari Butler's newest In The Meadow fabrics? They are oh so yummy! Stay tuned to see what I'm making! Have you ever wondered what goes on at the International Quilt Festival in Houston? Last October, I was there with a video camera to show you some of the highlights of Quilt Festival. I will be teaching at Quilt Festival again in November. If you have never been there, mark your calendars! I received a sweet surprise in the mail yesterday: a package of Sweet Bee Designs "In The Meadow" fabrics by Shari Butler! Shari is the force behind the Binding Babies and her fabrics are just as darling! I'm thrilled that these came before my trip so I can pet them while driving start stitching with them in my hotel room in Cleveland this week! Which Cutie Pattern should I make??? I seriously can't decide and need your help. I made another copy of my A La Mode Cutie Pattern last week, this time using nautical prints from Riley Blake. Fabric for top and binding for only $25? And free shipping on any order over $25? This kit is a steal! This quilt was easy as pie... A La Mode!